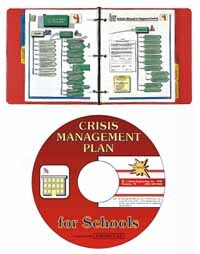 The Crisis Management Plan for Schools is a step-by-step, color-coded guideline designed to provide schools with an expeditious response to any emergency. The developer states that the responses are suitable to all school districts K-12, metropolitan or rural, regardless of size. The guide cover the covers the preparedness and response to 33 different kinds of emergencies including eight medical emergencies, nine violence and crime emergencies, shelter in place/evacuation, six facility emergencies, four weather emergencies, and four student welfare emergencies. The developer states that each of the crisis responses is cutting-edge safety technology, based on their safety expertise and consultations with federal and local regulatory agencies, school administrators, law enforcement, fire officials, hazardous material experts, transportation directors, and utilities personnel. The responses are presented in prioritized, step-by-step actions and are color-coded to each responder. The guide includes many graphics and four of its sections feature suggested workbook sheets for individualizing the plan to the responder's own district. The guide is available in two formats. The Red Notebook is a textual, color-graphic presentation with numerically prioritized step-by-step actions that each responder must take in response to emergency incidents. Also available is an interactive CD is with point-and-click technology in an easy-to-use format. It may be downloaded to one or many computers, either PC or Mac. The developer offers a no-obligation, free 30-day preview of their crisis plan. J. Berra Engineering, 333 N. Sam Houston Parkway E., Suite 230, Houston, TX 77060. Tel: 281-447-8300. Fax: 281-447-8088.